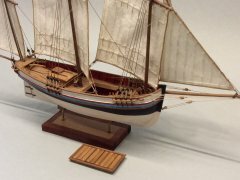 The quechemarines, whose name comes from the French chasse-marée, appear on the Cantabrian coast in the eighteenth century as the evolution of the freight boats, from which they gradually derived to a different type of boat, useful both for fishing and for the small cabotage. 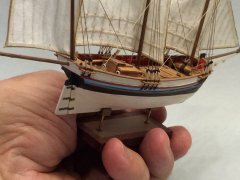 Of lines fuller than its predecessor, also presented a deeper sling that gave greater verticality to the fine stern, which improved the tight. 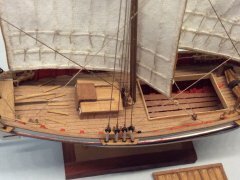 These forms of the hull required a large sail area to navigate with light winds, so they rigged the main and staysail with their corresponding topsails, accompanied by a smaller mizzen and jibs to assist in the government of the ship. 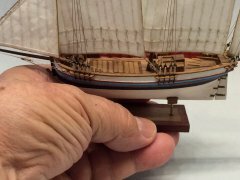 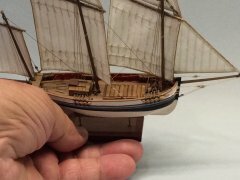 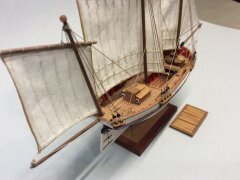 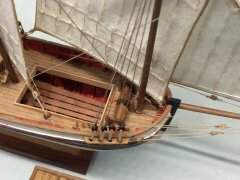 With harder times, the tall sails were lowered and some curl could be charged on the larger sails, even picking up the jib and the mizzen, so that the boat stayed in the typical rig of the chalupas. 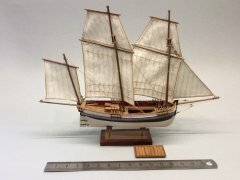 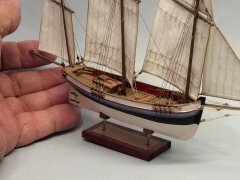 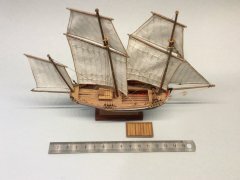 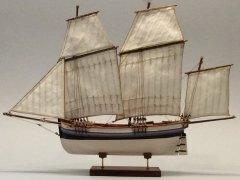 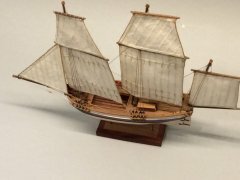 It was a type of ship very accepted by the owners of the Cantabrian coast due to its good sea conditions and much sought after for cabotage in the 19th century, which is why it was one of the most abundant types of vessels in those waters at that time. 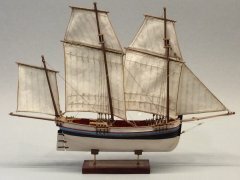 In Vizcaya, quechemarines dedicated to the transport of iron ore for steel mills in the area were specifically known as venacheros. 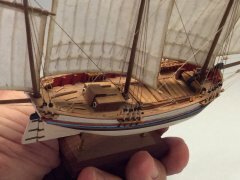 Beautifully done Javier – a real jewel of a model!